I’m going to the San Francisco Writers Conference! It’s February 12-17. I’m going to this particular conference because the novel that I’m trying to publish is very definitely set in San Francisco. I went in 2016 and had a wonderful time but did not use the contacts I made in any kind of useful way. I’m going, this time, to do it right. 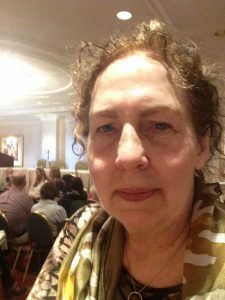 Sylvia at the 2016 San Francisco Writers Conference. So embarrassing. Did not do it right. Before the 2016 conference, I attended a class whose purpose was to prepare us to meet agents at a writers conference. We were told that we would have a very short time to pitch our book, maybe two to five minutes. The agent would then say, “No, thanks,” or ask to see a few pages, or ask to see chapters. Our job then would be to send the agent what they asked for when we got home from the conference. The instructor said that many, possibly even most, of conference attendees who are asked to send pages to the agents do not in fact ever send them. They rationalize this in various ways: The agent did not really want to see the material. Their book wasn’t good enough. The agent would just throw it away. Our instructor shook her head at the odd behavior of people. You went to the conference and met agents for the express purpose of having them see your writing and consider representing you. And didn’t the agent actually specifically ask to see pages? Why on earth wouldn’t you send them those pages the instant you got home? I too was puzzled. I knew that, if an agent asked to see my work, I would send it the instant I got home. At that conference in 2016, several agents asked me to send sample chapters from my book. Some of them asked me questions about the book and recommended that I make some changes. I thought they were excellent suggestions and would make it a better book. It is so embarrassing to admit this, but I went home from the conference, and…didn’t send anything. I decided to do a rewrite first, based on what the agents had said. But then I got busy and didn’t get around to the rewrite. I finally did it last year—it did make a better book!—and sent the requested material to those agents with an explanation. I did not hear back from anyone, to nobody’s surprise. This time I’m going to do it right. No matter what else they say, if the agents ask to see chapters, I’ll send chapters. I swear. If you’re going, see you there.